The year is 2002. The place, Beirut. Three young men are standing in an open-air car park in the depths of the city’s Achrafieh neighborhood. Two of them are rapping to the sounds of the other’s spectacular beatbox. One is bodypopping. It is late at night. The weather is warm and the rappers, dressed in baggy pants and cut-off shirts, heads ensconced in caps and bandanas, are spitting out Arabic slang in complex rhymes and rhythms, in between toking on joints and sipping cheap beer. A crowd of young boys surrounds them, occasionally cheering and clapping when one of the rappers, collectively known as Kitaa B, or Sector B in English (the B stands for Beirut), sounds off on a point they can all understand: displacement. Their lyrics are bitter and angry. “We are angry because at every turn we find walls put up to block our progress,” RGB, real name Rajab, a 22-year-old stunt Rollerblader, tells me before breaking into some more beatbox for his friend and fellow band member, Waldo, 24, to rap over. “The government needs to start looking out for the poorer classes. The kids who don’t have jobs, and can’t get them because they have no education. The ones who come out from their army service and don’t know what to do,” says Waldo, a Sudanese man who, despite living in Lebanon most of his life, has suffered continual harassment from the local security services for being black, eloquent and having no permanent Lebanese citizenship. The jam in the car-park feels like a scene from Eminem’s movie 8 Mile, a Beirut far closer to the Detroit of the Middle East than the well-trodden Paris reference. But it is a scene that Kitaa B, arguably the most fluid Arabic rappers ever heard in the city, are no longer part of. The year 2002 is long gone. 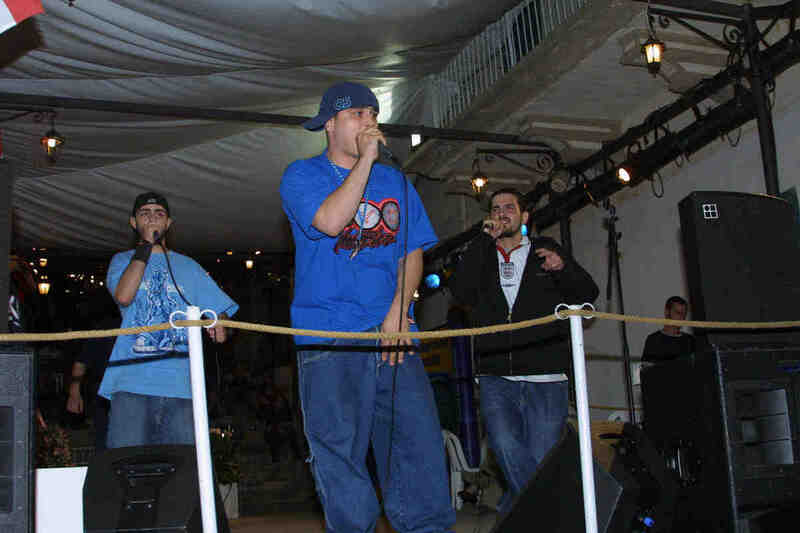 Soon after this rap session, the three boys from the streets — Waldo, TMC and RGB come from the poorer classes of Lebanon and met while dodging school and Rollerblading on Beirut’s Corniche, the wide promenade by the sea — traveled to France where they were invited to perform a concert at a Lebanese arts festival in southern French town of Cahors. The three skipped out on their return ticket back to Beirut, to risk staying in France illegally where they felt they had a chance of building a better life for themselves and where their music would be appreciated more. Not a rhyme has been heard of them since. Kitaa B’s harsh, heavily-accented rap spoke to many but failed to appeal to the more populist music-buying public or commercial radio stations in Beirut, which can only rotate a play-list of such manufactured pop as Britney Spears and mainstream “safe” artists like Dido. The resistance and provocation of their words often led to harassment from the General Security forces who would shut down performances and hassle them for criticizing the society and the regime who run it. Ultimately, Kitaa B were the pioneers of Beirut’s underground hip-hop scene — a scene born in the streets and poorer suburbs that sometimes touches with visionary independent producers leading to concerts and occasional records. Kitaa B’s rapping was lyrically skillful and flowing, intertwining words in unobvious connections. In the last issue, Bidoun introduced a series focused on hip-hop from the Middle East — explaining how the genre had traveled to the region, and been adapted by local bands from Egypt to Algeria, and Lebanon to Turkey, and in the Arab Diaspora. But there is a difference between the rap of those born into relatively privileged backgrounds, like Iron Sheikh in the US, and Clotaire K who is Lebanese but was born and raised in France and those who are living in the midst of their native countries. Will Youmans, a.k.a. Iron Sheikh, is a Palestinian-American  rapper hailing from Dearborn, Michigan, where his parents immigrated from Palestine in 1973. He raps on political issues with Arab-influenced music but in English. Clotaire K — his real name — who has been making waves in Europe with his heady mix of tarab (traditional music from the Middle East) and hip-hop beats, raps in French and English. Their audience, of course, is European and American and thus they push their politically loaded messages in a language that the audience can understand. Back in Lebanon, and further south in Palestine however, is perhaps where the most fascinating adaptation of the rap and hip-hop medium is happening — and it is happening in Arabic, a language so rich with variation and possibility. A language by its very nature, perfect for rapping. Kitaa B left behind the remnants of a scene that some others have stepped into. Their natural successors are the relatively untrained Kitaayoun, three teenage boys who named themselves after Kitaa B, managed by Zeid Hamdan of Lebanese trip-hop group Soap Kills. They, like both Rayess Bek — real name Wael Kodeih and one half of the Lebanese rap duo Aks’ser with Houssam Fathallah — and Palestinian rappers MWR in Israel, have used hip-hop and its attitude of resistance to carve out an identity for themselves and for Arab youth in a region which has otherwise witnessed a sense of increased disenfranchisement among young people from the mainstream of cultural and normal life. MWR, the initials of Wassim Akar and brothers Richy and Mahmoud Shalaby who founded the group in 1999, are one of the most militant local bands. They spit out angst-ridden rhymes in Arabic, telling of life in the bleak suburbs of Israel’s Arab neighborhoods in towns like Acre and Haifa — dark landscapes of drugs and crime, poverty and discrimination. Like Kitaa B, but in the even more politically charged environment of Israel, they have used the medium of rap, born originally of inner-city poverty and the struggle of black Americans for equality, as a weapon for the embittered younger generation of Israel’s 1.2 million Arabs. Hip-hop for them is a new form of protest but one that follows an old Arab tradition of passing down history and folklore orally and rhythmically, through stories and music. It is almost natural then that it should have been adapted so well in the Middle East region as a whole. And now, after a long time of waiting, and despite the lack of label interest in Kitaa B and MWR, major record companies are beginning to take notice, seeing the ability of Arabic rap to reach the masses. Rayess Bek has recently been signed to EMI Middle East — no small feat for an Arabic rapper who often ironically attacks injustice and whose 2003 self-released album “3am behkeh bil soukout,” a mixture of serious rhyme and humorous piss-taking on Beirut society, sold well in local record stores. Perhaps the most important point to be made about Arabic hip-hop and the speed with which new young groups are emerging, resisting and speaking their minds in their own language, is that it may just be the savior of the medium, the one that moves it forward while simultaneously taking it back to its beginnings. During a time when hip-hop in America (apart from progressive independents like Mos Def and Talib Kweli who attract little mainstream attention) is suffering from over-commercialization and sanitized polemics (see acts like Sean Combs and Black Eyed Peas), the new Arabic hip-hop culture is quickly overtaking it in terms of quality, ingenuity and thought-provoking lyrics.